On July 11, 2018, State Councilor and Foreign Minister Wang Yi held talks in Beijing with Minister of Foreign Affairs and Cooperation Ahmed Ould Teguedi of Mauritania who was in China for the 8th Ministerial Meeting of the China-Arab States Cooperation Forum (CASCF). Wang Yi expressed that China and Mauritania have enjoyed long-term friendship, and always understood, supported and helped each other. The Chinese side appreciates the Mauritanian side for consistently supporting China's efforts in maintaining its core interests and major concerns. In recent years, the two countries have consolidated political mutual trust, and smoothly advanced practical cooperation. 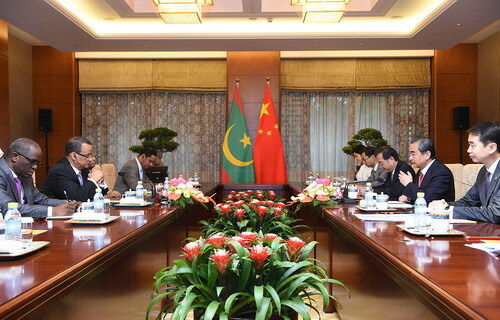 In the next step, the Chinese side is willing to, together with the Mauritanian side, accelerate the promotion of the process of the joint construction of the Belt and Road Initiative to promote the improvement and upgrade of bilateral practical cooperation in various fields, thus jointly pushing China-Mauritania relations for greater development. China supports Mauritania's endeavors in combating terrorism and safeguarding regional peace and stability. Ahmed Ould Teguedi expressed that Mauritania has always attached great importance to its relations with China, always abided by the one-China principle and always supported China's efforts in safeguarding its core interests. The Mauritanian side actively supports the Belt and Road Initiative proposed by President Xi Jinping, and stands ready to, by virtue of the two mechanisms of the CASCF and the Forum on China-Africa Cooperation, strengthen cooperation with the Chinese side in such areas as infrastructure construction, agriculture and fishery in the process of the joint construction of the Belt and Road Initiative. Chinese enterprises are welcome to invest and establish business in Mauritania, and participate in the process of Mauritania's economic construction. Mauritania is willing to provide assistance and convenience to this end.